Just another wonderful and easy macaroini and cheese. Add your cheeses, then add eggs, milk, salt and pepper. Mix and then put into baking pan, then put bread crumbs on top (LAST 20 MINUTES ONLY). Heat oven to 350 degrees. HEAT AND COOK FOR 35-40 MINUTES UNTIL GOLDEN BROWN. Heat oven to 350 degrees. HEAT AND COOK FOR 30-40 MINUTES UNTIL GOLDEN BROWN. Plus 243 othersFrom around the world! Made this tonight and it was awesome! This looks like a good, tasty, easy to do receipe when Grand Children are here. They are comming down in Dec. 2010 - time to try it. I like the rating you got for this meal. I love this stuff I use a five cheese blend sometimes but it is great like you have it posted. What size is a small package of mozzarella cheese? wow yummy this sounds creamy and delicious, thank you for sharing!! will def. come back & rate! My macaroni and cheese always comes out dry. I will try this. It loks wonderful. Five points! 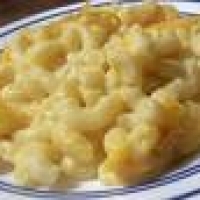 I agree with mjcm...my grandson thinks mac and cheese IS a food group. Love the mozzarella in this! You know when I was a child we were quite poor, but always had good food.. Ma would OFTEN fix mac n cheese with garden veggies with no meat extra and it was yummers!! It is a good recipe..I think you will love it!! I usually prefer some kind of meat in everything I eat, but sometimes even I need a change of pace. I'm going to give this a try. Thanks for the post. always a great comfort food that goes with anything.